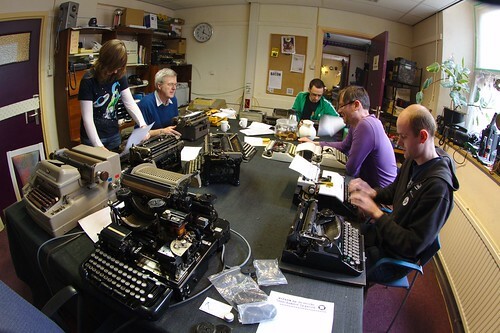 6 to 10 people and 16 typewriters, teletypes and telexes gathered in what we call the Library of the space. We compared all the fonts, as you can see in this blog post. Because the attending members of Hack42 are quite new to this “typewriter thing”, we were very lucky to have Jaap in our midst. 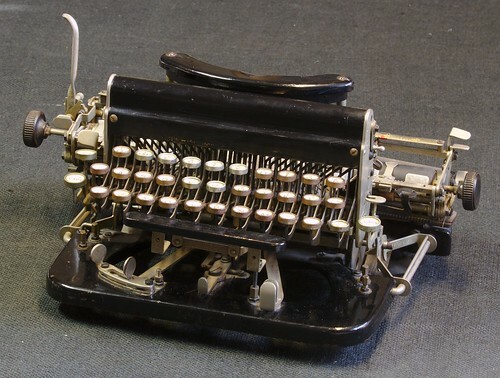 He knows a lot about the history and mechanics of typewriters and owns about thousand himself! 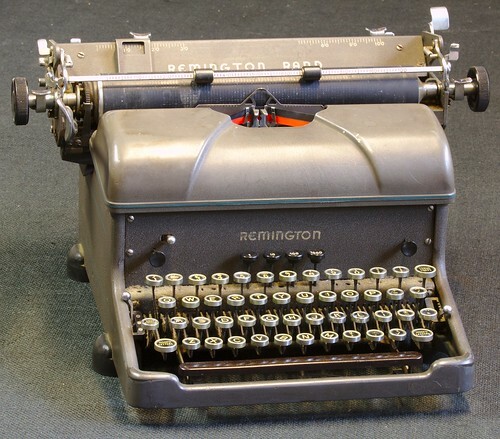 And Lurwah learned that the carriage of his Remington Rand could also be detached. This was quite a surprise to everyone! After talking a while about the attending typewriters, we all went to the Hannibal Lecture Hall to watch the Typewriter Movie. This film is about a machine and the people who use, love and repair it, in the 21th Century. 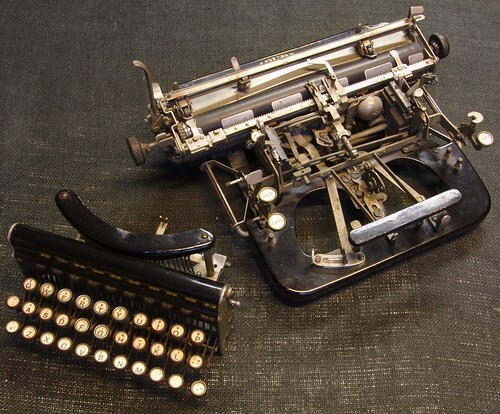 It contains 30+ interviews in 10 U.S. states with authors, collectors, journalists, professors, bloggers, students, artists, inventors and repairmen (and women) who meet up for ‘Type-In’ gatherings to both celebrate and use their decidedly lo-tech typewriters in a plugged-in world. Although the directors needed to fit in these 30+ interviews in a one hour film and information was snipped in very small pieces, it was a wonderful hour! It was great to see some faces behind blogs I regularly visit. And one of the repairmen in particular was very very old and also very funny! 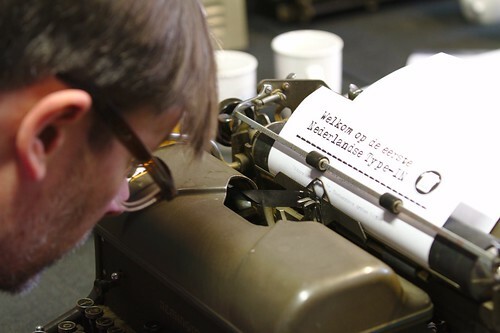 After the movie we went back to the Library to play with the typewriters. Soon the fast and loud clickety-clack filled the room. There were even two children who tried some out. I have collected all of the typed pages and will scan them in the next couple of days. Ofcourse there mostly Dutch, but I can translate the funny stories. After the type-in we shared a meal together and slowly each went our way back to home. Although we didn’t have many visitors, I consider this type-in a big success. It was a great afternoon and evening, with great people and wonderful machines. Next time we do this, we only need to pick a date which doesn’t clash with other events. Disclaimer: all pictures are made by dvanzuijlekom and can be found here. Great write up. I reckon any type in must count as a success and I am looking forward to seeing the typewriter movie sometime too. Nice! Could/should/would but have known… but to be honest probably would not have been able to make it from ‘the North’. Great to combine movie with type-in. Nice to see!